A lot of the guitars that turn up on my bench are kitted out with all kinds of high energy pickups, hand wound strings and expensive locking tuners in search of seemingly infinite sustain, tuning stability and tonal brilliance; yet all too often the guitars I see have been strung like this. 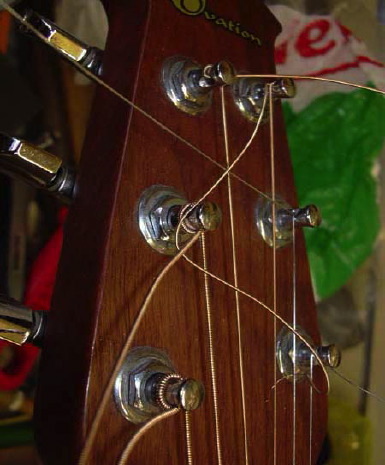 I discussed here how the tensile vibrations which travel the length of the string comprise mostly high end harmonics the strength of which define the tone and timbre of the sound. The tuners, as one of the two primary contact points for the string have a critical role to play in maintaining tone content and sustain. Loose tuners and badly wrapped strings will absorb energy from the string at every vibration cycle reducing tonal content and limiting sustain. 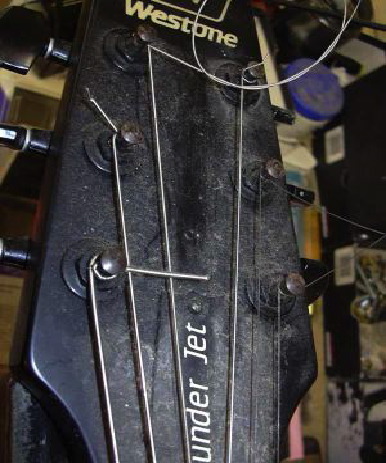 The correct procedure for restringing a guitar is an essential skill and one that few guitarists seem to bother learning. Tuners (or machine heads in popular jargon) fall into a wide range of designs and each one requires a slightly different approach for optimum efficiency. 3. Parallel post, radially bored eyelet. The last of these categories includes legacy designs found on early guitars, tuners for classical guitars and for slot-headstock steel strung guitars. A fourth type, rarely seen, has a tapered spindle and an eyelet bored radially and close to the "capped" top, in the manner of a naval capstan.